Pittsburgh Bishop David Zubik has informed members of St. Bede Parish in Point Breeze that a priest who lived there on and off between 1997 and 2006 has been arrested in Virginia on charges that he molested an 11-year-old girl. The bishop sent a letter to parishioners on Thursday outlining the criminal charges against the Rev. Felix Owino, 44, at the urging of a national support group for people sexually abused by priests. Owino lived at St. Bede from September 1997 to May 2001, and then again from September 2003 to January 2006, while studying at Duquesne University, the bishop said. 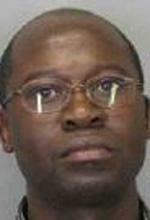 Owino was arrested July 8 while visiting a family in Fairfax, Va., according to police there. He is being held without bond on a single charge of aggravated sexual battery. A judge gave Owino's case yesterday to a grand jury, which will determine whether a trial is warranted, according to court officials. The bishop's spokesman, the Rev. Ronald Lengwin, said the diocese became aware of Owino's arrest several days ago. Zubik urged St. Bede parishioners to contact the Allegheny County District Attorney's Office, or the diocese "if anyone or any family who had contact with Father Owino believes that he may have done anything inappropriate." The bishop asked parishioners to "share this matter as gently as possible in your family and especially with those who were children at the time Father Owino was in Pittsburgh." Representatives of the Survivors Network of those Abused by Priests alerted Zubik yesterday that the group learned of three allegations of sexual misconduct against Owino while he served at Magdalen College in New Hampshire. They asked Zubik, and the bishops of other dioceses and universities where Owino attended or served, "to seek out others who may have seen or suspected his misdeeds." Judy Block Jones, the survivor network's Midwest associate director, said the allegations against Owino while he was in New Hampshire involved sexual misconduct with adults. Magdalen officials could not be reached to confirm Owino's employment. Karen Ferrick-Roman, a Duquesne spokeswoman, said Owino earned a master's degree in philosophy from the university in 1999 and a doctorate in philosophy in 2005. Officials at Wheeling Jesuit University, where Owino began working as an associate professor of philosophy in fall 2008, said the priest's relationship with their school ended in June. Owino lived at a parish in Weirton, W.Va.
Wheeling Jesuit said in a statement that it had not received any complaints about Owino from students during his two years on the faculty. After learning of his arrest, the Diocese of Wheeling-Charleston alerted Owino's religious superiors and suspended him from pastoral duties, diocesan officials said. A native of Nairobi, Kenya, Owino was ordained in 1992 and is a member of the Religious Missionary Institute of the Apostles of Jesus, based in Philadelphia.